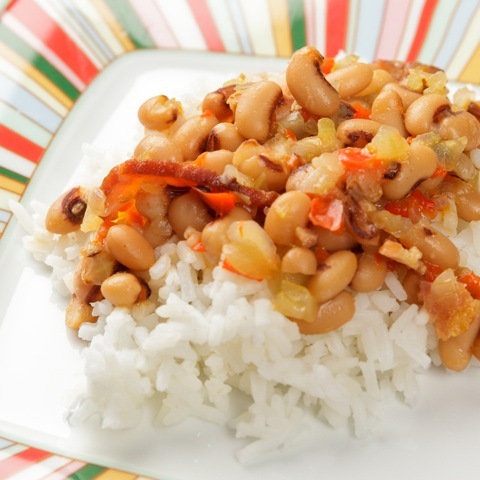 Full of authentic Southern flavor, this version of Hoppin’ John features Carolina Pride and lots of black-eyed peas. Heat butter in large pot over medium-high heat. Add onion, garlic, green pepper and celery and stir. Cook 3-4 minutes. Stir in beans, then add broth, salt and pepper, and cayenne to taste. Bring to a boil, then reduce heat and cover the pot for 30 minutes. After 30 minutes, check the liquid level. If it’s too soupy, cook with the lid off for another 15 minutes or so. If it’s too thick, add a little more broth. Stir in vinegar, then taste for seasonings. Add more spice if needed. Stir in ¾ of the bacon. Serve over rice, making sure to get plenty of the cooking liquid spooned over the top. Or, you may mix the bean mixture with the rice before serving. Garnish with remaining bacon crumbles. Variations: Add red bell pepper, diced tomatoes, diced jalapeños, or diced ham instead of bacon. Stir in torn-up kale when 5 minutes of cooking time remain. Use canned, drained black-eyed peas if preferred.